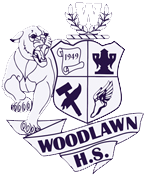 Please take a few minutes to complete the online EBRPSS Climate & Culture Parent Survey 2018-2019 for Woodlawn High School. This survey is part of the district’s AdvancED accreditation process. Your input will help support our continuous improvement efforts at both the school and district level. The survey can be found by clicking here. The survey will closed on December 14, 2018. Your input is appreciated. Monday-Friday: 7:02 a.m. – 2:25 p.m.
Half-Day: 7:02 a.m. – 11:30 a.m.